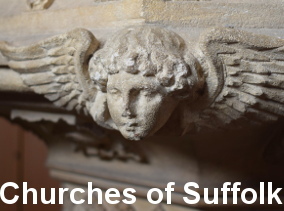 I'd been keen to find the site of this church. I'm a sucker for lost churches, and in St Olave's case, the village has all but disappeared as well, except for a farmhouse. I set off from near Creeting St Mary church, down a lane and past a sign that threatened a No Through Road after a mile and a half. Thanks to John Blatchly's excellent appendix to Cautley, I had an OS reference for the site, about halfway down this narrow lane, opposite Wolney Hall. There are no other dwellings, and the lane runs in a dip between ditches, the fields rising on either side. Trees overarched grimly, and it felt a bit sinister, the silence of this lonely track. This is one of the least travelled parts of East Anglia, this lattice of meandering ways that spreads between Stowmarket and Diss. In truth, I'd brought this mood with me; I was conscious that I was near to the spot where the body of murdered teenager Vicky Hall had been found a few months before. It was easy to imagine that a crime might go undetected out here. Those kind people at County Hall again - but I'd have found it anyway. I arrived at the OS reference, and was pleased to discover that the District Council had erected a plaque, as at Creeting All Saints, giving information about the long-disappeared church. It was here at the Reformation, but had gone by 1700. Excavations in 1998 could find no trace of foundations, but we know that Creeting All Saints was also built without foundations. The excavation did reveal, however, pieces of coloured medieval glass from the former windows. If you are on bike or on foot, you may continue along the lane, since there is still pedestrian access to Earl Stonham after about three quarters of a mile. I have to say that it isn't a particularly pleasant ride; the dip deepens, moss covers the road, dank woodland encroaches beyond the ditches. A scrapyard beyond the farm is surrounded by ugly corrugated metal sheeting, and a Rottweiller dog strains on an alarmingly thin piece of rope, barking his head off. I was glad to reach the civilisation of the main road at Earl Stonham, although it took a little longer for me to shake off that sense of foreboding, these ghosts of the past. The site of the former Creeting St Olave. The little building at the top is an oil tank. 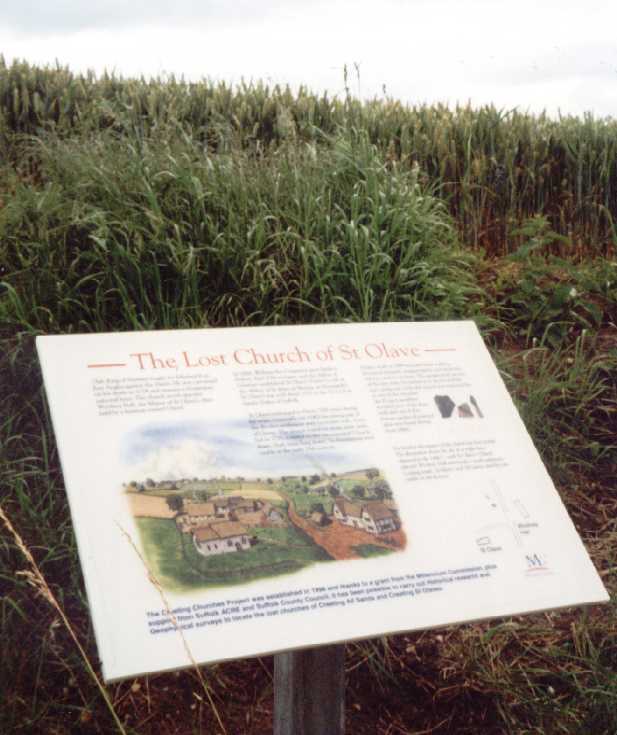 Despite its lonely location, St Olave is easily found. The OS reference is TM100576. take the road to the right beyond St Mary's church as you approach it from the south. Turn immediately right at the fork. You'll find the site (and plaque) opposite Wolney Hall. Be aware that there is no through road for cars to Earl Stonham - you'll have to turn around and come back.